The difference between driving a 360 that has a poorly set up suspension compared to one with the correct settings is like night and day. Setting up the suspension geometry can be done at home but I firmly believe that it is best left to someone with the correct equipment and that means a proper machine to accurately measure the wheel angles (see my “Recommended” page for a link). 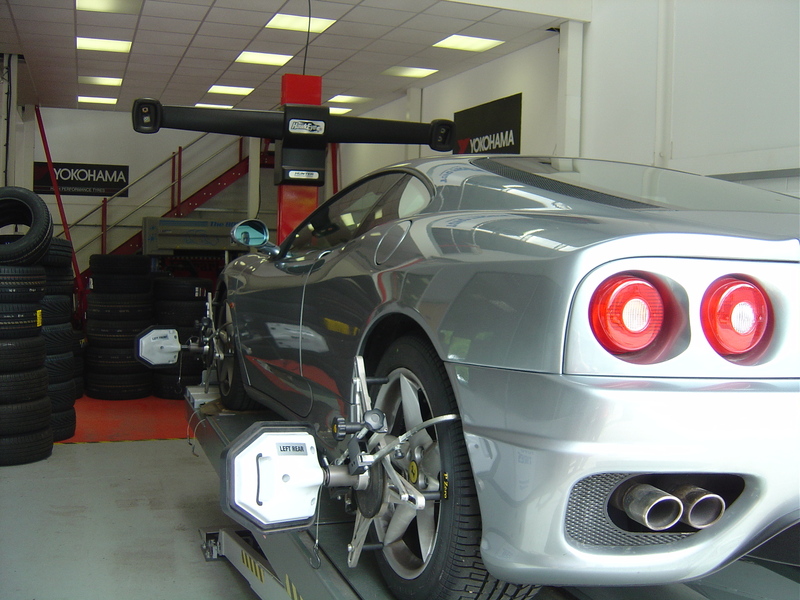 Here’s a picture of one of my cars on the ramp having its geometry measured – the machine in use here is a Hunter and is the same as Ferrari use in Maranello. If the height of the car is altered then the camber of the wheels will change. Camber is how much the top of the wheels lean into (or out of) the car from vertical. For a standard 360 Ferrari specify -1.01 degrees at the front and -1.26 rear. This is negative camber, which means the top of the wheel will be leaning slightly into the car. In general, negative camber gives better cornering but too much camber will be at detriment to straight line braking and acceleration performance. The Stradale has slightly more camber than a standard 360 (-1.28 & -2.00) and this is what I have my car set to. 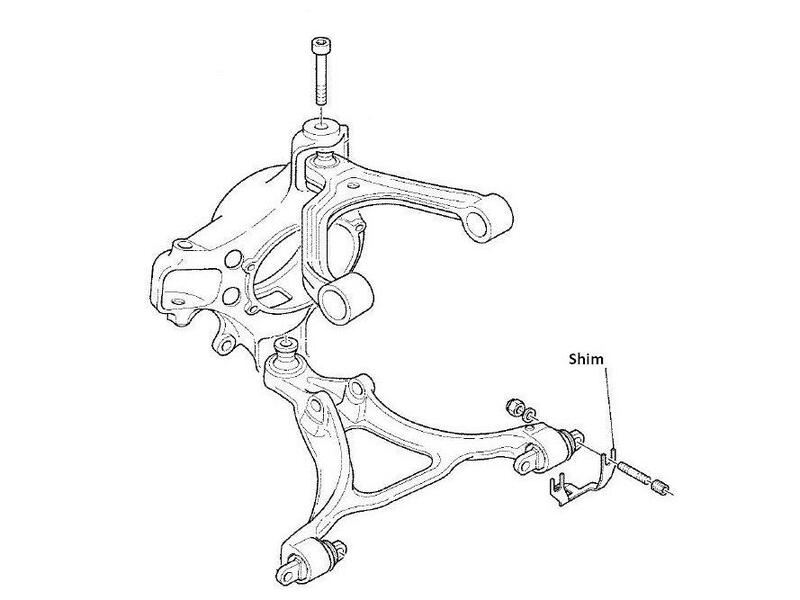 Changing the camber is a non-trivial exercise – it is altered by inserting or removing shims between the bottom wishbone mountings (flamblocs) and the chassis. Increasing the width of the shim pushes the lower wishbone outwards and thus the top of the wheel leans into the car more. The process runs like this: measure camber, jack up car, remove wheel, undo wishbone, insert/remove shims, refit wishbone & wheel, lower car & re-measure the camber. It is an iterative process so having an experienced person perform the adjustment will save time (and costs). The benefit of doing the adjustment this way is that once it is set correctly it is set period (barring any chassis trauma). The castor angle (caster in the US) is specified by Ferrari as a fixed 6.3 degrees. Castor is the angle between the pivot angle of the wheel and vertical when the wheels are pointing dead ahead. The angle is determined by the shape of the wishbones and should, in theory, be perfect regardless. In practice castor isn’t always to spec but someone experienced in setting up geometry should be able to recover the angle when setting the camber. To set the camber alone, shims are inserted/removed on both lower wishbone flamblocs by an equal amount. Varying the shim adjustment between the two flamblocs will alter both the camber and the castor. By adjusting two angles together the number of iterations to get things right generally goes up but once it’s done, it’s done. 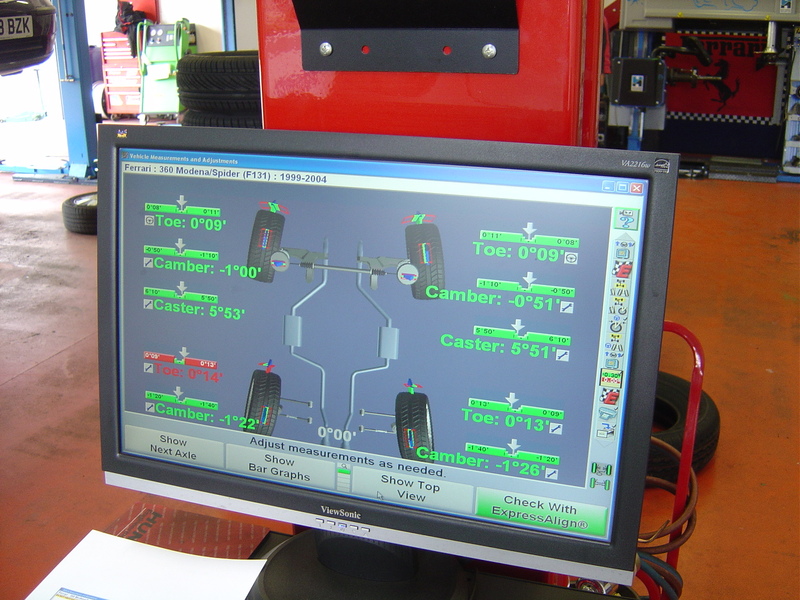 The last parameter to be changed is the toe – Ferrari specify the wheels to be toe-in both front and rear. Toe-in provides high speed stability as the wheels are trying to turn towards and against each other which means (on a flat surface) the car will not change direction unless the steering wheel is turned. Toe-in does impact how a car turns into a corner but for fast road and occasional track use I recommend staying with the OEM spec (1.25mm front, 1.5mm rear). Front toe is adjusted in the same way as any other car – by changing the length of the steering rack track rods. Rear toe is set in the same way, by changing the length of the rear track arms. 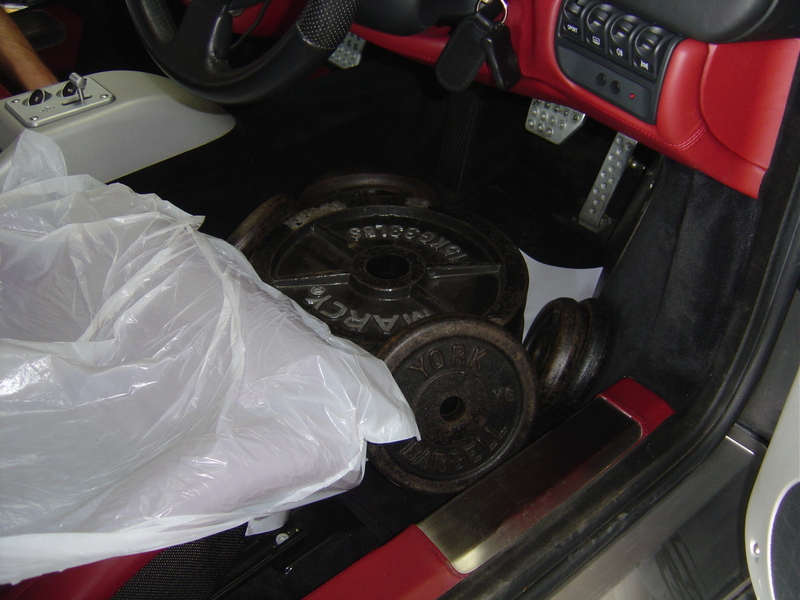 The static load and full tank is to ensure the car is set up correctly when fully loaded – however it does mean that when not fully loaded it will be wrong as the geometry does change with weight. In my mind a full tank is a bit silly as the car would only be ever full as you pull away from the petrol pump! Race cars are set with a static load equal to the drivers weight only but for street and occasional track use I would say it is insignificant. what size allen wrench is needed to remove oil plugs on the 360 modena? If there is oil in the motor and I remove the mesh screen does it all come out that opening also? Where can I buy the “Parafin” you mention? You are great…thank you sooo much. You need a 14mm and 12mm hex drive bit to remove the two plugs. Yes, you should drain the oil from the two plugs first. I’m not sure where you are located but it in the UK it is readily available. I think it is called Kerosene in the US. See the relevant post here: Link. THANK YOU SIR…I KNOW I WILL NEED YOUR EXPERTISE AGAIN…I AM DEBATING IF I SHOULD CHANGE OIL MYSELF…I REMOVED UNDER TRAY…WHAT A PAIN! DOES THAT MESH SCREEN FILTER ON THE GEAR BOX TIGHTEN EASILY WITH NO LEAKS? BY THE WAY…I READ YOUR INFO. ON THE STICKY STUFF ON MY CAR INTERIOR…WHEN I SCRATCHED THE INSIDE DOOR HANDLE WITH MY NAIL…THE WHITE SYMBOL SCRATCHED OFF…MUST HAVE DONE SOMETHING WRONG..O WELL! The mesh filter will seal very easily if the rubber ring seals are intact. The nut holding it in place doesn’t have to be tightened very much at all. Hi, is The hight measured with full tank and 70 kg*2 in The car? Thinkin to lower my car to stradale spec.